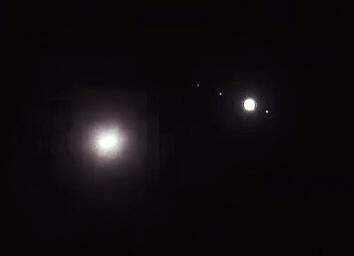 Thierry Legault: Video of satellite transiting Jupiter. The Iridium satellite (left) prepares its attack on Jupiter. I really need to stop being surprised by Thierry Legault. He’s an astrophotographer who specializes in getting ridiculously difficult real-time events. He excels at capturing satellites transiting (crossing in front of) astronomical objects, like the Space Shuttle Orbiter Atlantis crossing the Sun, or the International Space Station crossing the Sun during a solar eclipse. But his latest is a feat that puts those to shame. He caught an Iridium satellite crossing in front of Jupiter! Watch to the end; at 0:30 he switches to a telescopic view to prove the satellite passes directly in front of the mighty planet. Iridium satellites are used for global communication. The body of each satellite is kept at a very specific angle to the Earth, and has reflective surfaces on it that can reflect sunlight, causing what’s called a flare—I’ve seen dozens and they can be quite dramatic, much brighter even than Venus. Because the satellites are so rigidly oriented and the angles of the satellite body structure known, a flare is a very narrow event, and predictable (if you do the trigonometry). You can use sites like Heavens Above to find flares in your area, if you know your position. If you’re off by a kilometer or two the flare can be quite a bit dimmer. So in this case not only did Legault have to be in the right spot to see the flare, he had to be positioned to see the satellite pass in front of Jupiter, and do so during the flare. This is a feat of considerable planning. Those satellites orbit at a height above the Earth of 780 kilometers. I drew myself a little diagram (feel free to check my math), and I figure that if he had been off by more than about 70 meters to the east or west, the satellite would’ve missed Jupiter. Seventy meters! That’s amazing. I dabble in astrophotography, pointing my camera skyward and snapping away at a few things, hoping for the best. At the other end of that spectrum are people like Legault, who plan their sessions with extraordinary care and accuracy … and obviously, they get the big payoff. Bonus: I recently was alerted by high school physics teacher Christopher Becke that he caught the International Space Station flying past Saturn in the sky, too. Very cool! I am going to have to try planning something like this sometime. P.S. Legault also has a book he wrote on astrophotography that is quite good. Go see!